After the kids are all put to bed and the Mom’s find a comfy chair, Twitter comes to life. We talk about things that people probably shouldn’t really even talk about. We laugh like crazy, and someone usually ends up “spitting out their drink” after reading a tweet. We tease each other, complain about our kids, our husbands and our jobs. We have a whole lot of fun. The cool thing about Twitter is that you end up “meeting” people who are nothing like you. Quite often, you start out by having nothing in common except a mutual friend or a business that you both love. And soon enough you end up talking with hippies about things you know absolutely nothing about. For example, you learn about this. You will also learn that his name is Herman, and that you’re supposed to DRINK it. I’m still not really even sure what it is. Scoby or Kombucha or something like that. But it will always be scum growing in a jar to me. Always. You will then start hearing MUCH talk about the virtues of this item. For those of you that follow me on Facebook or Twitter, you will have heard me speak of Coconut Oil, and it will have made no sense to you. Until now. “People” will go on and on and on about how wonderful Coconut Oil is. How it can pretty much do anything and that it will change your life. And how it tastes SO good and blah, blah, blah. Did you know that you can use it as deodorant and also as toothpaste? It’s become such a running joke that pretty much any time someone has an ailment, or a problem with their car, or an itch or a scratch, we suggest that you rub coconut oil on it. No, it doesn’t make sense, but it seems to be a conversation topic that just doesn’t get old. During one of our nightly Twitter Chats, Coconut Oil popped up into conversation again. As usual, Meaghan was extolling its virtues and told us that she eats it right off the spoon. We quickly asked for clarification and were told that she does, in fact, eat it by the spoonful right from the jar. She dared us to try it. And now, I don’t know about you, but when a dare is presented, it is most definitely considered and quite possibly taken. Even though Jen and I are convinced that Meaghan is trying to convert us into hippies, I thought, “how bad can it be, it smells like tanning lotion and pina coladas”. Meaghan also did say that is was “nom” AND there was the threat of being disowned. So I did it, I ate a spoonful of Coconut Oil, right out of the jar. Jen was brave and also took the challenge, but was smart enough to record it with pictures. See her face? It was worse than that. 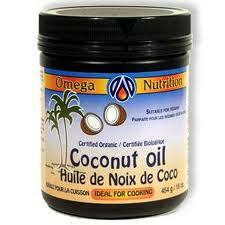 It WAS like eating a heaping spoonful of sun tanning lotion that tasted nothing like coconuts. It coated my tongue and throat and it took 2 days to “uncoat”. It was disgusting, and most certainly wasn’t life changing like a certain person had promised. It was sick and wrong. After M realized that we had actually eaten an entire spoonful, she tried to tell us that wasn’t what she meant. She just wanted us to “taste” it, a small tiny bit, “like on the back of a spoon”. Bah. Too late, we had taken her dare and J & I were now coated in Coconut Oil and were suffering. FYI … Water and Pop don’t help with the de-oiling but Salt & Vinegar chips do. The evening continued on with more chatter. 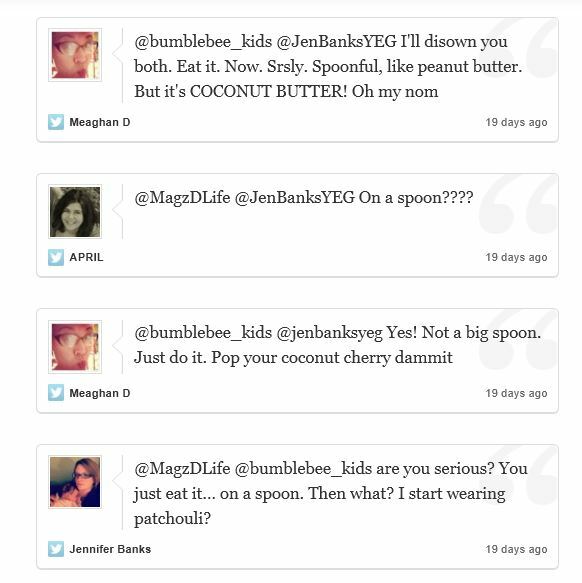 The coconut oil fiasco stayed forefront as we basically told everyone how Meaghan had tortured us. People were shocked that we would do such a thing, but once they learned that we had been dared, and our relationship threatened, they quickly sided with Jen and I. Eventually, a certain “someone” suggested that we were basically even as the jalapenos that she was cutting “were burning her eyes”. Ooh … yeah, so even. For some reason, she didn’t run to her cupboard and whip up the spicy, cleansing concoction. So I tried the same threatening tactics that she used on us. And still, in spite of that spirited plea, she refused to comply. She obviously isn’t as good of a friend as Jen and I are. So this is our gift to you Meaghan. 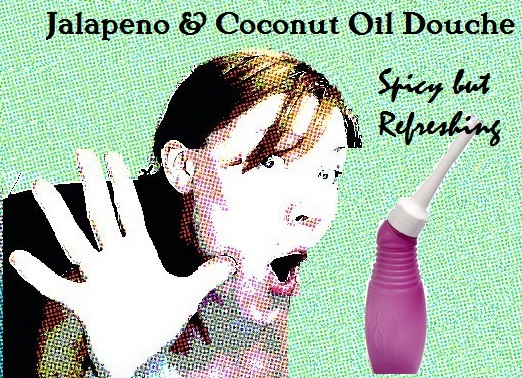 Consider yourself the poster girl for the all new Jalapeno and Coconut Oil Douche which I’m sure either you or one of your Hippie friends will be selling any day now. And watch your back sister, watch your back. Your time will come. P.S. Meghan is crazy cool. 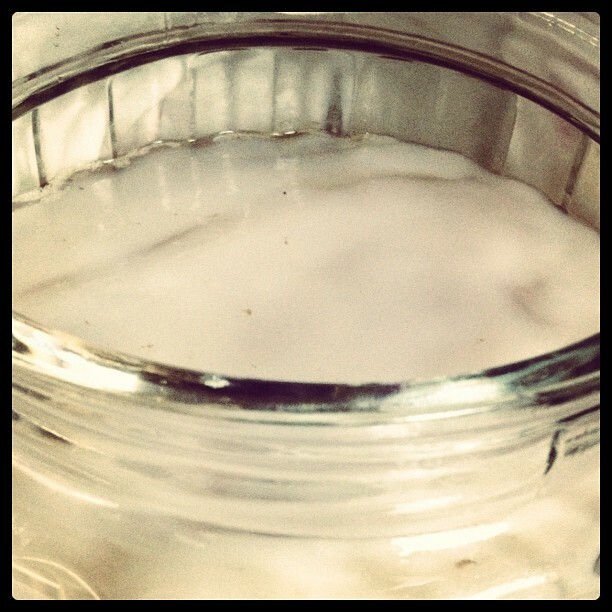 Coconut Oil really is pretty awesome, as long as you don’t eat it “like peanut butter”. I love Hippies but not Patchouli and I will never drink anything named Herman. This post was Day 5 of the 31 Day Summer Blogging Challenge ~ Please go and read what my other challenge buddies have to say as well! !